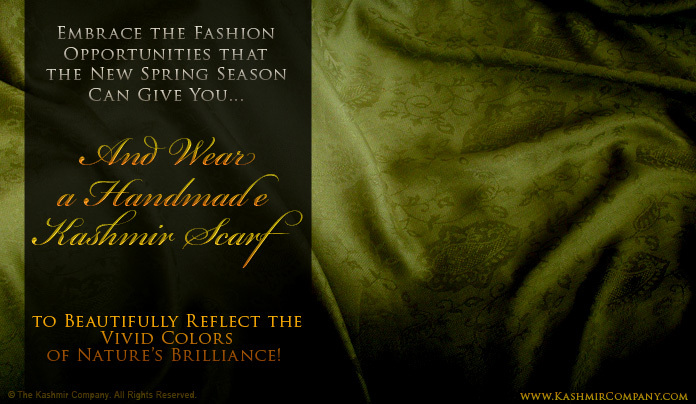 Embrace the Fashion Opportunities that the New Spring Season Affords You… And Wear a Handmade Kashmir Scarf to Beautifully Reflect the Vivid Colors of Nature’s Brilliance! The Kashmir Company is passionate about all the wondrous fashion possibilities that every Season gives us the chance to stylistically mimic. Our constantly changing Seasons Collections are a representation of our enduring desire to mirror the magnificence that nature effortlessly demonstrates. Every Kashmir Scarf from the Spring Seasons Collection captures the vivid colors and patterns of nature’s annual rebirth and blossoming! There’s no better time to FINALLY join The Kashmir Scarf Revolution by expressing your own rebirthing and wearing a gorgeous Kashmir Scarf to breathe an abundance of new life into your wardrobe. After all, your clothes and accessories are meant to express and demonstrate the way you FEEL about yourself. And there’s simply no better way of communicating your excitement for spring’s arrival than with a piece of fashion-art that’s as original as you are!